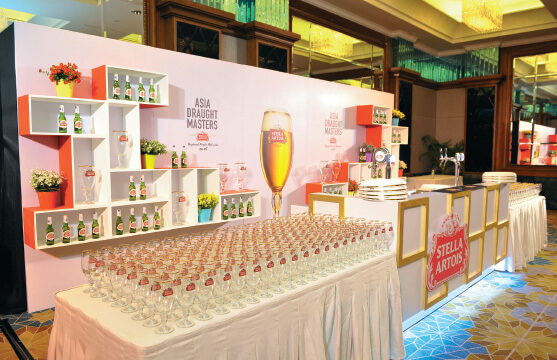 Competitions like the Stella Artois Asia Draught Masters 2016 Regional Final held recently in Mandarin Oriental Hotel Kuala Lumpur help to promote the pouring ritual. Stella Artois is clean, crisp, has great aroma and flavour, and looks elegant, says Soh. This article first appeared in The Edge Financial Daily, on July 28, 2016. Stella Artois beer is easily recognisable by the signature chalice that it is usually served in, but the iconic goblet does more than showcase the rich, golden colour of the brew. The presentation plays a role in the nine-step pouring ritual for the beer. Kenneth Soh, managing director of Luen Heng F&B Sdn Bhd, the sole importer in Malaysia, talks about this at the Stella Artois Asia Draught Masters 2016 Regional Final held recently in Mandarin Oriental Hotel Kuala Lumpur. “Belgian beers are traditionally served in unique glasses developed to accentuate each of the beer’s unique flavour profile. For Stella Artois, that glass is the chalice. The nine-step pouring ritual makes the best use of the chalice’s shape, stem and signature rim, and offers the best possible Stella Artois experience,” he says while introducing the beer that boasts over 600 years of brewing tradition. The nine-step pouring ritual that is the crux of the competition embodies the very spirit of Stella Artois. The process begins with purification, whereby the chalice must be cleaned and rinsed before the second step, the sacrifice, can take place. Here, the tap is opened in a single swift motion and the first drops of beer are poured before step three — dubbed liquid alchemy — which sees the chalice being held at a 45° angle, just under the tap. Step four, the crown, involves lowering the chalice to permit the natural formation of the foam head. The removal is the next step, where the tap is closed quickly and the chalice removed without any dripping, followed by the beheading — as the head foams up and threatens to overflow, a head cutter is deployed to smoothen it gently. Step seven, known as the cleansing, is when the bottom and sides of the chalice are cleaned. The eighth step is the judgment, and it is fundamental to note that the perfect amount of foam equals two fingers. The ninth and final step is the bestowal, where the beer is presented on a clean coaster, with the logo facing outward. “I am a beer lover and I would like to invest money to nurture the best bartenders in Malaysia. There are many factors that come into play when serving the perfect pour, like hygiene as well as the CO2 (carbon dioxide) levels. This is a good platform to reward the bartender because he or she plays an important part in serving a good beer,” Soh explains, elaborating on the importance of promoting the pouring ritual through a competition like the one held recently. Each step serves a specific purpose and ensures consistency. Soh also explains that practising each of the nine steps is crucial, not only to ensure the highest beer taste but also to add a theatrical element to the consumer experience. “Some may skip the second step — the sacrifice — to save cost but this will affect the taste of the beer,” says Soh, who started the business about two decades ago and has been bringing Stella Artois into the Malaysian market since 1996. Stella Artois, which was originally brewed to celebrate Christmas and named Stella (Latin for star) for its exceptional clarity, originates from Leuven, Belgium, just outside of Brussels. It has a pleasantly bitter flavour and refreshing finish that distinguishes it from other European lagers. It is recommended to only serve it in a chalice to best appreciate its colour while releasing the beer’s flavour and aroma.